Product Takeback/ Stewardship advocates and laws have manufactured a System for recycling #ewaste which requires maintenance and stewardship. The ship of Product Stewardship is seaworthy, but it's headed for an iceberg if the advocates are just focused on the next legal product and don't take responsibility for the takeback laws they already created. Check the List, Below, of TV recycling company closures and failures. The "Product Stewardship" movement needs maintenance... or at least some fiddling with. When devices go obsolete Stewardship advocates make manufacturers "fix the problem". But what's good for the goose, is good for the gander, right? Something is broken in E-Waste Stewardship. As I testified and wrote 5 years ago, electronics reuse markets are so complicated (compared to mattresses, paint, and alkalines) that "e-waste" was probably NOT the best product for wiser Product Stewardship Advocates to start off with. Now, the list of problems in the electronics recycling infrastructure in "ewaste stewardship" states is growing bigger. Primum non nocere - "first do no harm" - needs attention. But that's water under the bridge. We have these state "takeback" laws now, and a command and control system of accounting for residential TV recycling. Take a look out the window, my friends. Here is a brief (and incomplete) list of CRT Recycling Companies which have left the residential TV and computer recycling markets in the Northeast, some permanently. The squeeze of NOT reusing (liabilities in contracts banning exports), and subsequent glutting of CRT glass end-markets (prices better for buyers), has driven up costs, but there's no way to send a Price Revision. Meanwhile, in NY, NJ and PA in particular, some OEMs reportedly met their "obligations" and left these recyclers, and others, to "pound sand". My company is still around in part because of our good fortune losing our largest contract - Oyster Bay in NY Long Island, which we lost in 2012. The OEMs had said they met their goals, and we thank our lucky stars that a competitor talked Oyster Bay into dropping us as a vendor (that competitor is now on the "casualty list" below - focusing on commercial electronics and out of the residential stewardship game). 2TRG - Ohio Recycler that was part of EWSI Roll up. EWSI failed to fulfill its financing obligations to Good Point Recycling after GPR invested significant accounting. Creative Recycling* - Major service provider on East Coast (including NY, CT, NJ, PA), one of our biggest competitors in NY. CRT Recycling (CRTR)* Brockton MA - was one of our largest competitors in MA and NH. Eco International NY/PA* - This site was one of the oldest and most respected CRT glass processors in the Northeast. They reportedly left the largest (12k tons) pile of CRT glass during their bankruptcy. Ewaste Recyclers, LLC of Jaffrey, NH closed without finishing the recycling of CRTs they had accepted. EWSI Geneva NY - See 2TRG. They affected us not only by being a competitor without a sustainable economic plan, but triggered enforcement in NY raising the costs of recycling. MPC PA/MN* - One of our backup companies when we ran out of manufacturer obligation in NY, discovered with 2,500 tons unprocessed CRT glass in Philadelphia area. North Coast and Kuusakoski did not go out of the residential TV recycling business, but gave up even trying to pay for CRT glass recycling, creating a huge controversy with dumping CRT glass on municipal landfills as "daily wind cover". Sims Metal Recycling NY/NJ/Canada - Closed largest e-waste plants this year after $115M annual "write offs" for e-waste. StoneCastle - Not a Northeast player, but contacted Good Point to ship dozens of trailers of CRT glass in 2012, 2013 (to Retroworks de Mexico). We did not execute the PO based on our credit review, but this would have taken us down with them. Waste Management Inc. closed its CRT dismantling facility in Springfield, Massachusetts, three years ago. WeRecycle* CT/NY - The company went through a brief bankruptcy (shortly after taking over VT one-day events), was purchased by Hugo Neu Recycling, and then withdrew from residential recycling contracts. Had been one of the largest CED recyclers in CT, NY, MA, RI. This is probably over 50% of New England CRT capacity, down in flames (figuratively or literally), since the passage of Product Stewardship Legislation in the Northeast. 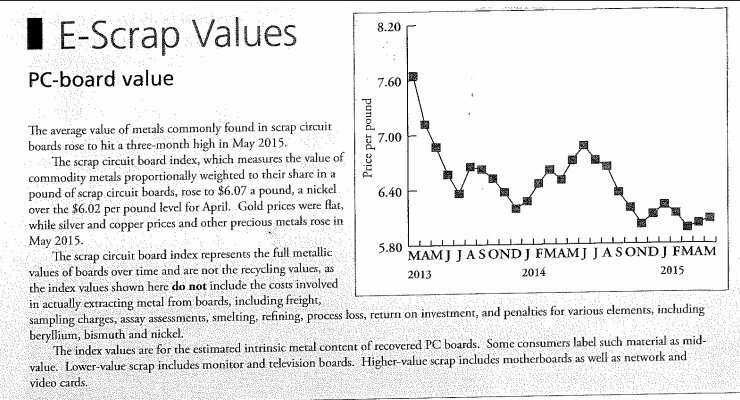 For the past 12 months, we've lost $250,000 just on scrap prices. The "high" is over. True, the Product Stewardship laws did create a booming supply, and brought expansion and investment to the industry. But now, prices for scrap have crashed, and there appears to be little way for large, single-payer contracts like Vermont's to make adjustments. And it's not just circuit/wiring board. Steel scrap prices have crashed. Copper scrap prices have crashed. Plastic scrap prices have crashed. The price of circuit boards has gone through the floor, following the lowest gold prices since the recession. As the USA dollar gets stronger, even reuse markets are shrinking. Good Point continues to meet all of its obligations, paying what is necessary to recycle the CRT glass, at smelters and new CRT furnaces. But we can't love a business that doesn't love us back. The cost of Certification (mandatory in Vermont) keeps going up, and the state keeps increasing its insurance requirements. We need to keep paying our staff a living wage, and that wage should be changing as the unemployment rates fall. CRT Recycling of Brockton may not be the last residential e-waste recycling company to "crash and burn". Since I own our building, there's no chance we'd abandon material here (I'd lose my home and life savings)... but that's a double edged sword as well. I can't play chicken with state agencies and OEMs. We have profitable clients - colleges, universities, hospitals, and businesses - which take a fraction of the space and labor to service. We may be one of the best flat-screen recyclers in the country, based on procedures we developed with recyclers and technicians... we could just do that, and steer clear of municipal collections for a few months. This is not a recycler crying about recycling. I'm a recycler forever. I just have to pay workers and fuel trucks, expense equipment, and meet all our obligations while saving the planet... or I won't be able to save it any more. There is a buyers market and a sellers market in scrap, and I've never stopped believing in recycling just because buyers (mills and furnaces) are having a good year. We'd like to pay the CRT glass destinations what they deserve... at the right price, the "glut" goes away. I've always believed in paying what it takes to recycle, as a signal to buyers and investors that urban mining is as sustainable as mining from rain forests. But if Product Stewardship legislation expects recyclers to keep picking up material when no one is paying the cost of processing it, we have to protect our workers and investors. I repeat, do not love something that can't love you back. It is the slow speed of addressing failure in any startup. In the private sector, you can't leave people in the rain. Right now, we are banging on the doors. Hey, Great People.. us normal people are dyin' out here. The improvement of human health, in Western medicine, went through a similar trial-and-error phase, and even a similar scatological fixation like today's Big Gaze on landfills. In the big picture, environmentalists are probably on the right track. My 25 employees are such a small picture, when the earth is at stake. Truth? Systems designed by environmentalists to recycle CRT display devices have been a monumental catastrophe. Some things worked, but some things crashed and burned. We have redirected from reuse to create huge piles of shredded (not chemically separated) leaded CRT glass. On a recent Saturday night, one of the larger Massachusetts CRT Recycling companies became the Xth in the northeast to go out of business. The cause of the fire at CRT Recycling (CRTR) of Brockton has been determined to be arson. The company was on the brink of failure already, having missed months of rent payments. The R2 Certification of the company will no doubt be questioned, like the ESteward certifications of Intercon, 2TRG, and Eco International. But politicizing the failures, or like one NGO in Seattle, propagandizing each failure with a press release to tout your leadership (? ), is not scientific or engineering stewardship. The breakdown of companies like CRTR has been documented, but if the root cause is not Product Stewardship Legislation, the question should at least be asked and explored. Scientifically, if a solution peddler - SERI, BAN, Product Stewardship Inst, etc - is going to attribute failure of a company to something, you need to examine all the failures, first. I'm not an expert in any of these former "CRT recycling" companies. If someone has a correction, send it along. It just kind of looks like OEMs payments and state employees doesn't care as much what happens as the recycling workers, or even the people paying to throw stuff away. Whether the "Product Stewardship" movement can rise to accept the same level of responsibility as they demand of manufacturers is the question. If Sony, in inventing the Walkman, should anticipate MP3 players and CDs, then it seems little to ask that a state environmental conservation agency should negotiate fair bids which pay enough to cover fair wages and the environmental destinies they insist upon. If every CRT stockpile can be blamed on manufacturers or recyclers or lack of (black hat DEP) enforcement, the "white hats" ("here to help") Stewards get off too easy.